At New Star, we are always finding ways to expand our consumers’ access to career-centered vocational training and long-term job opportunities. Our e-recycling facility, EcoSafe Processors, does exactly that. Becoming a member of the EcoSafe team means having the chance to earn a paycheck while gaining valuable training and work experience within the highly marketable “green” economy. We are committed to providing our employees with extensive, hands-on training in best practices regarding safety procedures, product disassembly, and data protection. 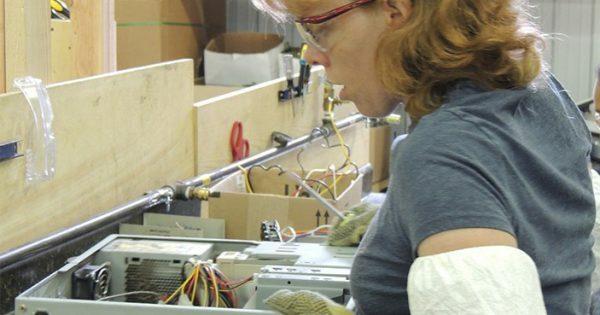 Once fully trained, EcoSafe team members each play a critical role within the success of the overall e-recycling process. Based upon skill level, team members may go off-site for supervised pick-up of e-waste (computers, calculators, hard drives, cell phones etc), sort waste products and prepare them for disassembly, or focus on breaking down each item in order to remove commodities, such as copper and gold, that are sold to downstream vendors. Like our janitorial program, our EcoSafe program also serves as a training ground for lasting community employment. Our employment specialists are available to assist employees in using their knowledge and hands-on work experience as a springboard to successfully transition into the private sector. For more information about becoming a part of New Star’s E-Recycling team, please contact Stephen Reilly at sreilly@newstarservices.org or Chip Young at cyoung@newstarservices.org.